Desert Mountain Consultants in Anesthesia, P.C. (DMC) has been acquired by Sheridan Healthcare. DMC provides anesthesia and pain services at thirteen locations in Phoenix, Arizona. Provident Healthcare Partners served as exclusive financial advisor to DMC. The terms of the transaction were not disclosed. “This strategic partnership will give Desert Mountain the foundation we need to succeed in the rapidly changing Phoenix healthcare marketplace. 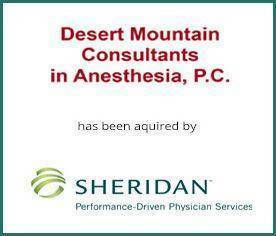 We are excited to join with Sheridan Healthcare and Valley Anesthesia Consultants in providing the highest quality care for our patients,” commented Mark A. Wix, MD, President at DMC. “The physician shareholders at DMC have built an extraordinary practice with strong community ties in the Phoenix area,” noted Craig Sager, Senior Associate at Provident Healthcare Partners. “The partnership with Sheridan will provide DMC with the resources of a national provider of anesthesia services and will best position DMC for rapid growth within their current marketplace and beyond,” stated Justin Hand, Managing Director at Provident Healthcare Partners. The Company was incorporated in July 1999 to focus on providing anesthesia services at John C. Lincoln Hospital. Initially, there were four founding members, but this has since expanded to thirteen Employee Shareholders. DMC also has a network of independent practitioners who assist in coverage when needed. Sheridan is the nation’s leading healthcare solutions provider for anesthesia services, emergency department services, women’s and children’s services and radiology services. Sheridan actively partners with physicians, hospitals and ambulatory surgery centers to improve performance and reduce expenses while increasing patient satisfaction. Sheridan’s collaborative approach and proven methodologies have served its clients since 1953. For more information, please visit http://sheridanhealthcare.com/. Provident is the leading investment banking firm specializing in merger and acquisition advisory, strategic planning, and capital formation for middle-market and emerging growth healthcare companies. The firm has a vast network of high-level, senior industry contacts, a thorough knowledge of market sectors and specialties, and unsurpassed experience and insight into the M&A process. Provident uncovers value and opportunities that others often overlook to create transaction premiums for its clients. For more information, visit the Provident website www.providenthp.com.